Ever heard song “rain, rain, go away” ? If you are moms, high chance you know this song. Substitute rain with pain, and you know which oil I want to talk about. That’s right! PanAway. It’s one of the oils I use when I have discomfort due to long walk or hard work, or sleep wrongly. I have 2 misfortunes associated with PanAway. First, when I started to use it almost 3 years ago, I checked in luggage during my travel. The result was the smell of PanAway filled the room when I opened the luggage. Yes, it leaked due to the safety cap! years later, I decided to use PanAway again. This time, it’s 15 mL bottle. I made blend for my sore muscles after whole day out with toddler and heavy stroller and groceries. 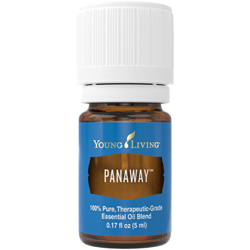 Night time, when I wanted to apply the blend, my hand accidentally knocked the almost new bottle of PanAway. It kissed the floor with bang. There goes my 15mL and I only managed to salvage 5mL and put in normal bottle (no safety cap) and I am glad to tell you that the bottle is fine now. Ok, back to topic. What’s so powerful about this blend. Wintergreen – the most phenolic component. Phenol has the ability to clean the receptors. However, there’s no pure phenol occurs in nature. Pure phenol is toxic. Our oil is not. Pure phenol found in oral wash and toothpaste (not YL ones). so go figure. Helichrysum – one of my favourite oils. Peppermint – one of the most versatile oils. It cools you during the heat. apply back of the neck and around ears. Let me warn you, you need to prepare carrier oil in case you cant stand the coolness/heat. My daughter will ask for peppermint when she sits on the toilet throne. It invigorates me when I feel sluggish.